Starting a blog is a very easy process but takes a little bit time. There are hundreds of even thousands of guides and helpful material are available on the internet about “How To Start a Blog?” which you can explore. Here I’ll also share a ultimate guide about “Starting a Blog” which you can check it below. What is a Blog or Weblog? If you just heard about somewhere to starting a blog and make money online through your blog then don’t start it. Because blogging just about passion. And if you’ve not passionate about anything and just starting a blog to your friends advice, then stop here. But if you’ve a passion and want to choose blogging as a career. 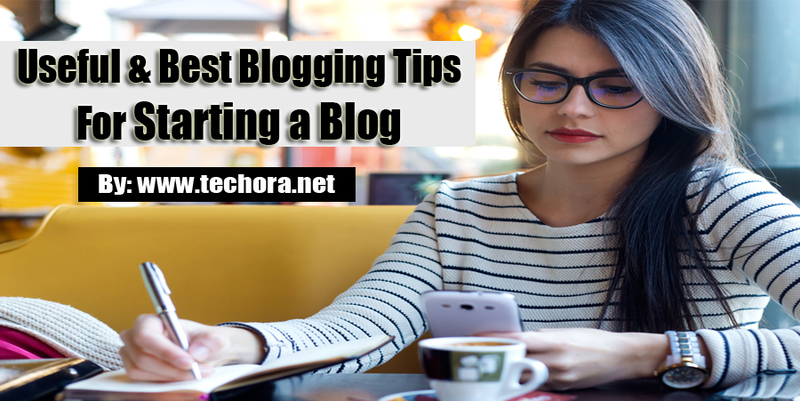 Then there are many basics steps and some additional tips for you before starting a blog. SEO (Search Engine Optimization) is very important because it starts before starting website. If you don’t know about SEO then your blog doesn’t rank in search engine and you’ve not received any kind of organic traffic from search engine like Google. It is not compulsory to learn the whole SEO, just follow it’s basic tips and tricks and then utilize it in a proper way and see the magic. For this purpose check our these posts. Keyword Research is related to SEO, but it is also a huge separate topic in blogging and website era. If you don’t know how to do keyword research and find profitable keywords for your blog post, then don’t start a blog. Keyword research is a method of researching best keywords for your blog post topic and then use wisely inside your post and getting high ranking in SERP. Guest blogging is just like you write a blog post for other well established blogs to getting some traffic to your website or blog and getting quality backlinks. Creating and generating Backlinks is not a hard stuff, but quality backlinks is a very hard thing especially today blogging age. So first learn about how to get quality Backlinks and then start a blog. Backlinks are very important for this purpose you can try guest blogging, forum posting, commenting on other blogs which are you niche related, making videos, join communities and social media sharing. Social bookmarking sites is also a very famous and useful method to getting high quality and natural backlinks. These methods helps you to getting high quality backlinks and then see out the magic of backlinks after seeing your ranking in search engine especially in Google. People ignore this point, but if you know little bit about SEO, then you now the importance of domain. Domain is the URL of your blog or simply call web address of your blog. Always choose domain related to your website niche or topic. Domain name must be short and unique but simple which your readers easily memorize. Plagiarism is a very bad thing for your blog success, because if you copy paste anything from other sites then search engine robots like Google Panda, Penguin detects that plagiarism into your blog and then drop your ranking or even banned you. You can use many free online plagiarism checker tools for this purpose. Blog niche or topic is very important because after choosing it you can write on it always. People choose wrong blog topic and then comes under disturbance. Choose blog topic according to your interest and taste and in which you’ve some knowledge and you’re passionate about it and exploring it more. There are many blogging platforms are available where you can easily start your blog. But choose it wisely. There are two main and most popular and useful platforms which are used by every one, www.blogger.com and www.wordpress.org . These helps you to start a blog and getting higher ranking. But I’ll recommended you to choose WordPress ,because there are almost 70%+ websites are on used WordPress CMS system which shows it’s popularity. If you start a blog on WordPress or any other self-hosted platform then the very first question is that which is the best web hosting service. Because to their servers you site hosted, and suppose you’re hosting your site on any webhosting platform, and when your reader comes to your site and your site doesn’t shown him / her, then what they feel. So always choose best web hosting services that provided 24 / 7 and 365 / Y services and their uptime support up to 99.99%. Don’t ignore it this is very important and your first step while starting your blogging journey. When you writing a post, even writing a fully optimized and high quality contents but don’t add any image or video then your readers must be bored. Like without colors life is boring, same like in blogging, without media blogging is boring. So always try to add at least one or two images and if required add video too and then see the magic of media. There are ten thousands plus WordPress plugins are available which you can use and save your time. These plugins are used for different purposes, like for SEO purpose, image optimization, Cache management, database management, social media management, etc. You cannot use all of them just choose according to your needs. Here you checking many plugins that helps you into your blogging journey. Website or blog template / theme is a look like of your brand. People find you easily if you’ve a unique template. I’ll also recommended you not use any third part or free template just buy a premium template which is unique, awesome, SEO friendly ,mobile friendly etc. You can buy the world most trusted site Themeforest of any kind of themes, plugins, scripts etc. Always use Google services like Google Webmaster Tools, Google Feedburner , Google+ , Picassa etc that helps you a lot for getting higher ranking. When you create a blog the very first thing to do just adding your blog with Google Feedburner service that your readers helps you to follow your blog via email. Are you ever listen “Content is King” if Yes , then you must know the value of this phrase. Basically blogging is all about contents. If you don’t writ a unique, fresh and valuable and useful contents for your readers then you cannot become a professional blogger. Content is king, so always mainly focus on contents rather than other things. If you write a good looking, professional and unique high quality contents then there must be a many chances to your success. In today world when every one use internet and people find anything on the internet which they want. Website speed is important factor for your blog or website success. If your website takes a lot of time for fully loading their web page, then your visitors can’t waiting until it’s load, they close your site and go ahead to others. So it is very compulsory for you to make your page loading time decrease and make your website more faster, that can be easily loaded. In my point of view, there are 90% + blogger doesn’t use forums for posting. Because they don’t know the value of forums. Forum posting is a very amazing and helpful thing which gives you proper and high quality backlinks to your site, and also gives you the high quality and targeted traffic to your blog. So don’t miss out this opportunity and try to use forums. People want to see some human behind anything. Same like in blogging, when any one comes to your blog and share their comments / suggestions / questions below the post then always reply it. Many bloggers don’t reply back to their readers, and their readers sad out after waiting their response and very easily abanding your blog. So if you want your readers becomes your daily readers then always reply back their comments as soon as possible. Just like Quora or Yahoo answers communities, always participate in that kind of communities and engaged with others. If you gives respect to others they will gives respect back to you. These communities helps you to grow your blog readers plus also gives you new ideas of creating blog posts and getting results from it. If you decide to work as a blogger and choose blogging as your career, then the very first thing that you always remember that is be active in blogging community. Watching what happened around the blogging community and how to survived in this age. Always make new friends to your niche related or at least blogging related. Be active on social media and share your contents with them also like and comments their contents too. This is the best method to engaged with the communities. Social sharing is a very important in blogging. Always adding a beautiful, awesome but simple fast loading social sharing widgets to your blog. So when your readers comes to reading your posts, they can easily share with their own friends.In this way, your readership improves and you’ll getting more traffic and backlinks from social media. Email marketing is the very important and now a days very powerful marketing technique that helps us to grow our business leads, sales etc. When you start a blog, try to start collecting email list and build it as much as you can. Without any inspiration, we can’t survive. We give up very early without any motivation and inspiration. So always find some inspirational things that motivate you to go upward and fulfill your dreams and never ever give up anyway. When you building your email list then don’t send an emails as long as many others. Because your readers doesn’t read long email and delete it. So my advice is that, always writing a short email with main point in which you talk about.This will helps you to engaged with your readers more and more. Whenever you pickup any one of your dreams and fulfill it, then always share that kinds of motivations with your readers and inspire them. People always watching that kind of stuffs that helps them to never give up and working hard. If you starting a blog on any topic but not know where your audience exists in the world, then your blog is not getting any ranking. So after selecting your topic, first of all find your audience and targeted that country where your audience exists. For this purpose you can use different online free tools. In which the most popular and amazing tool is Google Trend. Because blogging is not become successful if your readers doesn’t engaged with you and your blog. So always adding and asking some kind of questions within posts, that helps your readers to engaged with you more and answering that questions. Always write article in your own way and create a unique voice to your readers. People like that if any human being behind any website or blog that they can easily contact and engaged with him. So always tried to writing into your own style and make it perfect as much as you can. When you starting a blog, you also follow many other successful and top bloggers and their blog contents that helps you to find which is done in today blogging world. So always checking the hot trends on these top blogs and then write on that particular topic and targeted as much audience as you’ve a ability. Always be consistent and never give up. I also seen many bloggers that starting a blog and then leave it and not published posts on daily basis. It is very important as a blogger to being work hard and be consistent always. If you don’t be consistent then your identity will be loss and your blog ranking drop down. This is not last tip,but in my list this is the last number which is promoting your blog. If you want to see your blog reaching on the next level then always promoting your blog. You can use different methods which are some of free and some are paid. Like you can use social media sites that helps you to freely promote your contents and blog posts and share with the world. You can also promote your blog via your email address. Always adding a signature with your blog name and URL, so when you send any one , they can see it and hopefully click on it. So these are the 30 best blogging tips for bloggers to starting a blog and make your blog successful. These tips are the best ever in blogosphere, and without that tips you cannot run your blog for a long run and doesn’t getting higher ranking. So simply follow these list of best blogging tips and took your blog to the next level. I’ll also adding more tips in it after reviewing your suggestions, so if you find that something missing in this list then please tell me in comment box below, I’ll also featured your suggestions and tips in this list and make this list more powerful and useful for bloggers. Don’t forget to share this post with others on Facebook, Twitter, Google+ etc. Happy Blogging ! ! !